How the Elders Cooked The following excerpt is from the interview of Margaret Elkins of Westville. "The family of the Woodalls that came from Georgia were all fullblood Cherokees. They knew cooking the old Cherokee way. They ate the simplest of food. The food that could be found on most of the tables would be wild meats, corn and bean bread, pumpkins and dried fruit. At that time fruit was plentiful in the woods, but fruit jars were not known so most of the fruit was dried. The way they dried the fruit was by the sun method. They built a scaffold of poles out in the yard. The fruit was peeled and cut in small pieces and placed on the scaffold until dry. This was sacked and stored up in the lofts of their homes. The sweet potato was another common food in those days. Many sweet potatoes were raised by the Cherokees. They also knew how to take care of them better than they do now. Plenty of wild meat was stored away in the winter. Hogs ran wild over the hills in this part of the Cherokee Nation and hundreds of them were killed every year. There was no law to prohibit anyone from killing as many as his family could make use of. But they had to have a claim in the woods in order to do this. These hogs stayed fat all the year. There was planty of meat. Soldier Sixkiller was the greatest hog raiser in this part of the country. He owned several hundred." More About Cherokee CookingThe following excerpt is from the interview of Jennie Hines of Westville. 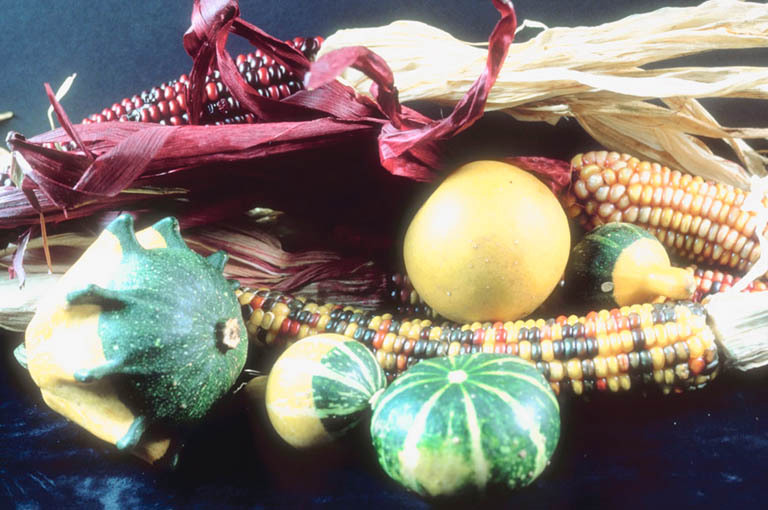 - "The Cherokees at that time lived on the simplest food that they raised at home. Bean bread could be found at almost every table. Hominy, dried corn, dried fruits, and wild meats were their chief food. They did not can much food. There were no fruit jars in this country yet. They usually dried their fruits and meats. Most of the wild meats at that time were deer, turkey, squirrels and many other small animals. There were a few buffalo in this country at that time. There were several to be found around Pryor." She recalls the times when the Cherokees, including her father, would go on hunting trips. They usually went to the Grand River just south of Pryor. She remembers at one time these Cherokees killed four of those animals at once. The custom of the Cherokees at that time was to call all of their neighbors together when they had something good to eat. Mr. Phillips, after arriving home, called several of his neighbors to share in the feast. The meat tasted similar to beef. These hunting expeditions would generally last about two weeks. Deer sometimes would leave this part of the country and go to the Salt Springs near the Grand River to lick the salt. Buffalos did the same. It was when this happened that the Cherokees went on these expeditions. The meat was dried so it would keep during the summer months. In the winter they would hang this up as they do beef. She recalls at one time Uncle Adam Palone who lived on Ballard Creek, would come and trade some sorghum for buffalo meat. Palone was the molasses king at that time. Prairie chickens were numerous in the prairie where Westville is now. The Palone molasses mill was located on Ballard Creek. This was a queer outfit as we would call it now. The juice was squeezed through wooden rollers into barrel and boiled in kettles. This usually sold at forty cents per gallon. Usually this was a means of exchange for Mr. Palone. People those days traded among themselves. This was known as the old barter way. If you had any surplus you traded that for something that others had and you needed. How Salt Was Made "There is a place near Salina that has salt springs, I well remember when I was a small boy, my parents and some of the neighbors would go there every year to make salt for their year's supply. They had three large kettles, four feet across the top and about three feet deep. They would build up a large fire under each of these kettles and fill them up with this salt water and boil it until the water was all boiled away. Then they would take out the salt that was left in the kettles. As near as I can remember we got about three or four gallons at a salt cooking, and the part I played in making this salt was to keep the fires burning for there had to be just so much fire burning all the time under each kettle and it was up to us boys to keep that fire just so. After the old people would get the kettles all filled with water they would all gather around and smoke their pipes until the water was all boiled away and the salt ready to take out. We would get about five cooking off in a day's work. There would be as many as twenty-five families at a time gather to make their year's supply of salt. I remember there were three springs very close together. Two of the springs had water that was clear, cool and good to drink. The other spring was where we got our water for the salt." 1 teaspoon seasoned salt Mix all the ingredients together; place the mixture in a loaf pan or shape mixture into a loaf and place in a cooking pan. Bake at 350 degrees for 45 minutes or until firm when pressed in the center of loaf. 1 teaspoon of chili powder Cook the ground bison meat and onions in a frying pan or pot over a medium high heat until bison meat is browned and the onions are soft. Stir the bison meat with a potato masher to break it apart as it cooks. Drain off the fat. Add the remaining ingredients, mixing well, and cook until heated through. Mix ingredigents adding more flour if necessary to make a stiff dough. Roll out the dough on a floured board till very thin. Cut into strips 2 X 3 inches and drop in hot cooking oil. Brown on both sides. Serve hot with honey. Make certain the cooking oil is hot enough, or the fry breads will be doughy, undercooked, and oily. Cherokee Hard Bread This bread was made for long journeys and used the batter recipe listed above but was rolled out into donut shapes and baked until very hard. After the bread was baked it was laid out in the sun until it was dry and even harder. The bread was then strung on a cord like beads so it could be easily carried. At meals the bread was stewed or moistened with other liquids to make it soft enough to eat. Stir first three ingredigents then stir in the beaten egg. Add milk to make the dough soft. Roll it out on floured bread board, knead lightly. Roll dough out to 1/2 inch thick. Cut into strips 2 X 3 inches and slit the center. Drop into hot cooking oil and brown on both sides. Serve hot. Sift flour,salt and baking powder then add milk and more flour to make dough stiff. Roll out onto floured bread board and cut into 4 X 4 squares with a slit in the center. Fry in hot cooking oil until golden brown. Drain on plate with paper towels. Mix the flours, salt, sugar and baking powder together. Add about 1/2 cup water and mix well, adding a bit more water if needed to make a stiff dough. Roll it out on lightly floured surface and knead until dough becomes elastic and smooth. Let it stand for 10 minutes. Cut into squares, strips, or circles about 1/2 thick. Deep fry in very hot oil until golden brown. Drain on paper towels. Drizzle honey over bread and serve immediately. Heat oil to 360 degrees in a heavy 5 qt saucepan. Stir together the flour, baking powder and salt. Gradually stir in water, knead dough until no longer sticky. Cover and let stand 15 minutes. Pull off 2 in. balls of dough. On lightly floured surface, roll each ball into a circle about 1/4 inch thick. Pierce circles of dough several times with a fork. Deep fry until both side are golden. (about 3-4 minutes) Drain and serve with honey, powdered sugar or jam. Fry bread may be wrapped airtight and frozen up to 3 months. Reheat in a foil packet in a 350-degree oven for 15 minutes. Before serving open the foil to allow the fry bread to dry out on the outside. Mix flour, baking powder and salt. Gradually add in the shortening and water. Add only enough water to make dough stick together. Knead dough until smooth, make into fist-sized balls. Cover them with a towel for 10 minutes then pat them out into circles about the size of a pancake. Fry in hot cooking oil in cast iron skillet until brown on both sides. Drain on paper towels, serve with jam. Disolve yeast in warm water then add salt and sugar. Let stand for 5 minutes covered with a towel. Add flour and oil to liquid mixture. Mix and put on floured bread board and knead until mixture is smooth. Put dough in a greased bowl, cover with towel and let it rise for 1 1/2 hours. Remove from bowl and put on bread board, knead in the 1/2 cornmeal. Make dough into 2 balls rolling each into 12 inch circles 1/2 inch thick. Cut into 2 inch squares and drop into hot cooking oil. (Works best with cast iron skillet.) Fry 5 to 6 pieces at a time for only a few moments. Drain on paper towel and sprinkle with white powdered sugar. Use one of the bread recipes above. Roll the dough out extra thin and cut into slices about 4 X 6 inches and put a small amount of chopped cooked beef or chicken on each piece. Fold the dough over and pinch the edges. Fry in hot oil until browned. Indian Tacos Fry some ground beef until it is nicely browned, seasoning the meat with salt and pepper to taste. Drain away the excess fat, and spread a layer of the meat onto a piece of hot Navajo Fry Bread. Then add shredded lettuce, shredded cheese, chopped onions and chopped tomatoes. Um...very tasty! Wash onions and chop them into small pieces including the green tops. Boil in water with water just barely covering the onions, add 1 tbsp. bacon fat. Boil 20 minutes, or until the onions are tender and the water has been asborbed. Stir eggs into the onions and cook an additional 5 minutes. Some people like more eggs than onions so with this recipe you can adjust it to your own preference. It is a traditional springtime meal that is delicious when prepared properly. Slice the tomatoes 1/2 inch thick, but do not peel or core. Drain well on paper towels until most of the moisture of the tomatoes is absorbed. While the tomatoes are draining, make the batter. Beat the eggs then mix in the corn meal, water, minced chives, salt and pepper. In a large iron skillet, heat the butter or margarine until very hot. Dip the tomato slices into batter, and brown quickly on both sides. Serve hot. One of the most primitive and perhaps favorite method of cooking was stone-boiling which was done by heating stones until they were very hot then dropping them into a tightly woven basket of water or other liquid. The container did not have to be fireproof. 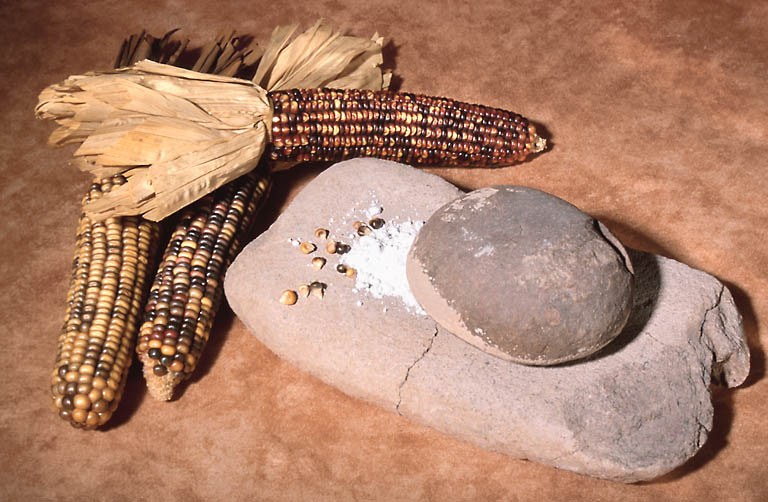 The Cherokees made loaves of bread using clay pottery. They poured the batter into a clay pot with another pot placed upside down over the pot with the batter. Then both pots were covered with red hot coals to bake the bread.